Nearly two weeks after our celebration of the supposed beginning of the new millennium, "the lights are still on, the faucets are still running and the ATMs are still giving out cash." This is "good news for everyone but the Y2K doomsayers, who . . . have a lot of explaining to do." The "nation's computers hit the '00s without mishap." Now, "thousands of disillusioned preparers seethe . . . ." — Why did they waste "their time, their faith and their money getting ready for an apocalypse that never materialized?" (Hanna Rosin, "Y2K Doomsayers Have Some Explaining to Do," January 6, 2000 Washington Post). For those of you who missed it in hardback, the paperback edition of Ed Yourdon's book, Time Bomb 2000, will soon appear on bargain tables. More than 250,000 copies were sold over the past two years, thanks in part to its now-infamous back-cover inscription: "Saturday, January 1, 2000. Suddenly, nothing works. Not your phones, not the cash machine, not even your fancy new VCR" (quoted in Rosin). Convinced by such doomsayers, Gary North, of the Institute for Christian Economics, urged people to do what he did: Flee to a mountain hideaway to prepare for the inevitable Y2K disaster. Those responsible for sounding false alarms included both secular and religious writers. The problem is, of course, that Christian, so-called prophetic writers associated their predictions of Y2K disaster with their vision of the End Times, the Second Coming of Christ, and their interpretation of the Millennium. If you tell your friends that you are coming to see them on Friday, and you don't show up, they may think that YOU are a liar. But tell them that Jesus is coming on Friday, and when he doesn't show up, they may be tempted to think that GOD is a liar, and that his Word is a farce! It is bad enough to make people skeptical of your own honesty, but when you make them doubt God's veracity, it is much worse! (Duane V. Maxey). Overly confident preachers and popular writers, who have attempted to interpret the "signs of the times" by holding the Bible in one hand and the newspaper in the other hand, while looking toward the Middle East out of the corners of both eyes, have not only developed crossed eyes; they have always been wrong. As a result of their false alarms, they have shattered the faith of countless gullible souls, who have failed to distinguish supposedly authoritarian pronouncements based on purely human speculations from the simple truths clearly taught by Scripture. The obvious point of this teaching is that only God the Father knows when the end will come, and he's not telling. Perhaps even God himself does not know, if he has not decided yet. There are some biblical passages that seem to suggest that God's decision depends on the outcome of certain plans he has set in motion, the outcome of which are not yet determined. Following Jesus' resurrection, the disciples asked him, "Lord, is this the time when you will restore the kingdom to Israel?" He replied, "It is not for you to know the times or periods that the Father has set by his own authority" (Acts 1:6, 7; NRSV). Thus, it is not only futile, it is misguided to attempt to know God's mind on this subject. So far, all who have claimed to know have been wrong. Our task is to bear witness to what God has already done in Christ, not to speculate about future events (Acts 1:8). Of the dozens of examples of false alarms I could cite, I will mention just a few. When I arrived on the campus of Olivet Nazarene College as a first-year professor in 1977, apocalyptic fever was in the air. In the Spring revival of the previous school year Evangelist Chuck Milhuff had predicted that the "Rapture" might well occur on September 15, 1977. The frequency and intensity of special prayer-meetings, of course, subsided as the day came and went uneventfully. In 1988, Edgar Whisenant, a former NASA scientist, predicted that the "Rapture" would certainly occur on September 11, 12, or 13, 1988. After those dates passed, he reissued his book — 88 Reasons Why Jesus Will Come Again in 1988 — under a new title and claimed, "The Rapture must occur . . . before" May 14, 1989. And here we are more than a decade later. Wrong again! It is remarkable that people imagine they may know what Jesus does not and angels cannot know. The contrast between Jesus' reticence and the bold pronouncements of those who allege to speak for him is particularly obvious when you consider the claims made in the writings of one of the most popular and prolific writers on End Times in the past thirty years — Hal Lindsey. His first book, Late Great Planet Earth, revised several times, has sold more copies than any religious book in history, other than the Bible. The first edition of Late Great Planet Earth appeared in 1970. In it Lindsey claimed that the world would come to an end by destruction in thermonuclear war, "within 40 years or so of [May 14,] 1948" — the date of the establishment of the modern nation of Israel (p. 43). Here we are, more than ten years past 1988, and Hal, now 70 and old enough to know better, has not yet learned his lesson. In his recent books, Lindsey has stressed the importance of the 1967 "Six-Day [Arab-Israeli] War." Although he now refuses to set precise dates, he hints that 2007 is the likely year for the Second Coming, with the "Rapture" occurring in 2000. When Lindsay appeared on Art Bell's Radio Program on February 9, 1999, he insisted that Jesus would definitely come again within the lifetime of those who witnessed Israel's statehood in 1948. He also speculated that Y2K chaos would make a particularly good time for the appearance of the Anti-Christ, whom he believes to be now alive and living in Europe. Wait and see. The latest multimillion copy bestsellers in Christian bookstores are Tim LaHaye's and Jerry Jenkins' Left Behind series. Although fiction, they are written on the questionable premises of the mistaken end-time views made popular by Hal Lindsay and other dispensational writers like him. Why do Christians read such things? For the same reasons that non-Christians read horoscopes, call psychic hot-lines, and love to be scared to death by horror movies. They want to know what is unknowable. Despite all that Jesus taught, modern prophetic writers insist that there are knowable signs that allow us to know when the end is drawing near. And such claims sell books and magazines, even Newsweek. The year 2000 is, by no means, the first, nor is it likely to be the last, "prophetic" date set by convinced, but misguided, souls. Overly confident prophecies are nothing new. Jesus warned his disciples that "false prophets" would misinterpret the signs of the times, deceive, and alarm believers (Matt. 24:4-25). So he urged his followers to be properly skeptical: "If anyone tells you . . . [they know how to interpret the signs of the end], do not believe it!" (Matt. 24:26-27; NIV). But too many Christians have ignored Jesus' warning. Eschatological Calculus The fact that we number this year as 2000 is in itself a testimony to earlier failed attempts to know the unknowable. Our calendar is a completely arbitrary means for doing end-times calculations. The calendar we now use did not become generally accepted until the eighth century. The Roman calendar dated years from the founding of the city of Rome. The Jewish calendar, a fairly late creation, attempted to date events from the creation of the world (Annus Mundi, AM). When the Roman emperor Constantine became a Christian (of sorts) during the early fourth century, the Church adopted the Jewish calendar. But as the supposed seventh millennium since the world's creation drew near — our AD 500 — the Christian populace became preoccupied with predictions of the end. In response to this problem, the Western Church revised its estimate of the world's age downward by several centuries. But this only delayed the problem. As our year 800 — 5999 by their calendar — drew near, eschatological hysteria again ran rampant. In response, the Church adopted the Annus Domini (BC / AD) calendar, still in use. It employs the Incarnation rather than the Creation as its starting point. But the calendar makers miscalculated the date of Jesus' birth by at least four years. The reminder in 2 Peter (3:8-15) should have been sufficient: The Lord does not use our calendar. For him, a day is as a thousand years; and a thousand years as a day. Delay in the fulfillment of his promises is not a sign of his failure, but of his patience. Delay gives more people more time to repent, so they can be saved. The reason for our Church's reticence to offer detailed elaborations on the Second Coming are simple and sound. Dr. H. Orton Wiley, the first president of Northwest Nazarene University and the leading theologian of our denomination for its first half century explained our brief statement as the result of studied silence, not as a license to speculate freely. In his Christian Theology, which was for forty years required reading for all ministers in the Church of the Nazarene, he wrote: "The fact of the second coming and the order of events connected with it are separable questions" (3: 245). Thus, he urged that one should speak on the details of this subject with "considerable hesitancy . . . cautiously . . . [and] with becoming modesty" (3: 306-307). 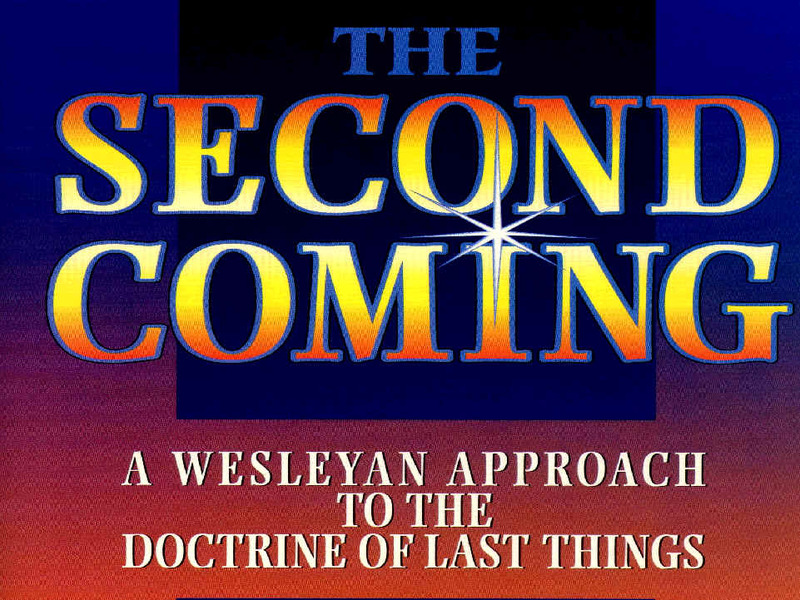 Dr. Wiley aptly described the Second Coming as "one of the most delicate and controversial fields of theology" and a theme "which has periodically agitated the church" (3: 243). If I say more than that Jesus will come again, I risk offending you. If I say no more, you might mistake my silence to suggest that any interpretation is as good as any other. I do not believe that for a moment. I agree with Dr. Wiley that the details are "not vital to Christian experience," but merely matters of "peculiar fascination for the curious minded" (3: 245). And we all know what curiosity did to the cat! There are at least two other reasons why I risk saying more. (1) Inadequate attention has been given to the practical implications of our hope in the Second Coming. And (2) many sincere Christians have been needlessly confused by overly confident — and, therefore, mistaken — interpretations of the Second Coming. Since the early 19th century the Millennium has been an obsessive preoccupation of conservative Christianity. Unfortunately, those who have written and preached most extensively on the subject of eschatology have generally been advocates of bizarre views. Those who have held saner interpretations — including me, of course — have often been reluctant to enter the discussion. I have no interest whatsoever in creating unnecessary controversy by making an issue of a subject that is speculative by its very nature. Nevertheless, I am persuaded that a Wesleyan interpretation of the Millennium is more adequate than that of popular, evangelical Christianity, simply because it is more faithful to Scripture and not dependent on preconceived ideas with little or no biblical foundation. I also believe that Wesleyan views are more adequate, because they are more dependent on ancient Christian tradition, not innovations introduced first only during the 19th century. You may decide for yourself, if these views are also reasonable and consistent with Christian experience. For nineteen centuries Revelation 20 been the most disputed chapter in this most difficult book of the Bible. The controversy centers around the meaning of the thousand-year reign of Christ reported in Revelation 20:4-6. Four major schools of interpretation of the Millennium — Latin for "thousand-years" — have arisen. Equally devout Christians have espoused the first three views since the earliest centuries of the church. Historic Premillennialism assumes that Christ will come again to establish an earthly kingdom of 1,000 years before the eternal order begins. Postmillennialism assumes that the Church will succeed in establishing the lordship of Christ on earth before he personally returns to inaugurate the eternal order. Amillennialism assumes that Christ's first coming began a spiritual kingdom over which he will reign until his Second Coming brings in the uncontested, eternal kingdom of God. Both Post- and Amillennialism understand the number 1,000 in a figurative sense. You can find examples of historic premillennialism, postmillennialism, and amillennialism in the eclectic writings of 18th century Wesleyans — John Wesley and his Methodists. Most early Wesleyans of the Holiness Movement during the 19th century were postmillennialists. But only since World War I has the fourth view crept in to Wesleyan circles. Dispensationalism, the fourth view, is definitely a latter-day doctrine, appearing for the first time in the early nineteenth century — in the 1830s to be exact. The first person to espouse dispensational views was Margaret Macdonald, a 14-year old Scottish lassie. She attended the Catholic Apostolic Church, pastored by Edward Irving, who is remembered both for several failed predictions of the date of the Second Coming and as one of the founders of modern Pentecostalism. The Rapture-idea came in the form of a nightmare — or revelation, if you will — that Margaret shared frequently in her public testimonies. It was adopted and disseminated by a visitor to her church, the Reverend J. N. Darby, founder of the Plymouth Brethren. It was popularized in Calvinist circles by the notes in C. I. Scofield's Reference Bible and gained a wide audience in the preaching of evangelist Dwight L. Moody. Dispensationalism is a distinctive kind of premillennialism with a number of novel views. Perhaps its most controversial innovation, which distinguishes it from all three classical millennial theories, is the separation of the Second Coming into a two-part event — a secret Rapture that is to precede the public Revelation by as many as seven years (see The Rapture: Truth or Speculation?). This doctrine of a secret Rapture belongs exclusively to dispensational premillennialism. Although it originated in a post-biblical "revelation" to a teenager, evangelical advocates ever since have attempted to secure it on the basis of biblical interpretation. An unprejudiced reading of the evidence, however, persuades most serious students of the Bible that the doctrine does not have a single exegetical leg to stand on. The only biblical passage that comes even remotely close to mentioning the term "rapture" is 1 Thessalonians 4:16-17. There the "catching up" of living believers is not pictured as an event distinguishable from the Second Coming of Christ. On the contrary, the Rapture is the counterpart of the Parousia. When Christ comes down, living Christians are caught up. Whatever the "Rapture" may involve, the Bible does not present it as an eschatological event that is distinct from the Second Coming — that is, separated from it in time — by three and one-half or seven years, as in the speculations of dispensationalists. It is what will happen to living Christians when Christ returns, just as resurrection is what will happen to dead believers. It is certainly not a secret coming of Christ in advance of a public coming. And it certainly does not prepare for a period of tribulation during which time rebellious humanity has a second chance to repent in advance of "the real thing." In an obviously parallel passage in 1 Corinthians 15, the Apostle Paul discusses the Second Coming without reference to the term Rapture at all. There instead of spatial imagery, he uses the imagery of biology, and writes of a transformation — metamorphosis — of living believers — a dramatic change from mortality to immortality that will enable them to enter into the eternal kingdom of God. For when Christ comes again, the end comes immediately thereafter — no second chance, no intermediate period. When Christ comes again, "that's all she wrote!" Dispensationalists generally presume that an eschatological event described in the so-called "Little Apocalypse" in Matthew 24—25; Mark 13; and Luke 21 is to be identified as "the Rapture." one will be taken and the other left (Matt 24:40). one will be taken and the other left (Matt 24:41; cf. Luke 17:41). one will be taken and the other left (Luke 24:40). Against the dispensationalist assumptions stands this evidence. The Greek term that may be translated as "Rapture" in 1 Thessalonians 4 nowhere appears in these passages. Nor does the passage say who is taken and who is left. In the preceding verses the point is that the coming of the Son of Man will be like the coming of the flood in the days of Jonah. When the flood came, the wicked were taken away in judgment; only Noah and his family were left behind. So if these Gospel passages are to be associated with the Rapture, you may want to reconsider whether you want to be taken away or left behind. Enough on dispensationalism. Let us return to our reflections on the Millennium. It is not my intention to persuade those of you who hold other views to abandon yours in favor of mine. My goal is not to change your minds, but to encourage you to use them. I am not prepared to disparage either the intelligence or Christian character of those who disagree. I hope they extend me the same consideration. In Revelation 20:1-3 John's vision turns from the grisly judgment scene that concludes chapter 19. He witnesses a heavenly angel descending, carrying two objects. The first is the key to the Abyss, "the bottomless pit," the "gloomy dungeons" where fallen angels are "held for judgment" according to 2 Peter (2:4), ruled by an "angel . . . whose name in Hebrew is Abaddon, and in Greek, Apollyon" — "Destruction" (Rev. 9:11). Earlier chapters in Revelation describe the Abyss as the origin of "the beast" (11:7; 17:8). The second object carried by the angel is an enormous chain. Holding the chain, the angel seizes the dragon with his free hand, overpowers him, and chains him up for a thousand years — a Millennium. Revelation 12 describes the dragon as a hideous, red monster with seven heads and ten horns and seven crowns on his heads (12:3). There, as here, it is clear that this is not intended literally. The dragon is the devil, or Satan (as in 12:9), the source of the authority wielded by "the Beast" (13:2, 4), whose capture and destruction John reports in Revelation 19 (v. 20). Satan's supposed "power" must be a part of his deception (v. 3). For his arrest requires, not an elite angelic SWAT-team, but only a nameless angel. What kind of literal chain would bind a spiritual being like Satan? The binding of Satan on any interpretation must mean that Satan's ability to carry out his sinister designs is severely limited (see v. 3). Revelation's frequent use of symbolic numbers suggests that 1,000 was never intended to refer to a literal period — exactly one year more than 999 and one less than 1,001. 1,000 is ten cubed just as 144,000 (see Revelation 7 and 14) is 12 squared times ten cubed. If 144,000 does not limit the future residents of Heaven to this exact number, why should the thousand-years not also be taken figuratively? Within the symbolic thought world of Revelation, the 1,000-years — the Millennium — refers to the entire period of human history between Christ's first and second comings. Thus, the "millennium" would be an indefinite, comparatively long, but limited period of time known and determined by God alone (see v. 3). If so, the binding of the dragon must refer symbolically to the partial, but genuine, defeat of Satan accomplished in the incarnation, death, and resurrection of Jesus Christ. Once the angel has captured and bound Satan, he throws him into the Abyss (v. 1) and locks its door. The angel then seals the entrance to the pit to assure that the lock is not opened by unauthorized parties. The purpose of the angel's actions is to keep Satan from deceiving the nations anymore — to prevent him from leading "the whole world astray" (12:9). This curbing of Satan's activity is to continue until the Millennium is ended. This implies that there are people on earth throughout "the Millennium" whom Satan might attack, were he not confined. Neither Satan's alleged cleverness, the failure of the chains, nor the breaking of the lock release the devil. He is set free by God's inscrutable decision — let out on parole for a short time (see 12:12). Revelation 20:7-10. For the moment, let's skip over verses 4 through 6 and turn to verses 7 through 10, where we read the end of Satan's story. After the Millennium, God releases ancient "Adversary" from his prison in the Abyss (see 20:3), for reasons we are never told. Not at all reformed by his long imprisonment, Satan returns to his old ways (see Rev. 12:9 and 20:3). Once again, he goes out to deceive the nations. The purpose of his deception is to renew their rebellion against God. He has learned nothing from the earlier defeat of the beast and the false prophet and their anti-God forces (see Rev. 19:19-21). And so he gathers from the nations an innumerable force to do battle against God. This passage is difficult to reconcile with any literal interpretation of the book. If all unbelievers have already been destroyed, as Revelation 19 reports, who does Satan deceive? If the Millennium refers to some future age, after the Second Coming, is the eternal destiny of resurrected believers still in jeopardy even after the Second Coming? Or are we to presume that dead unbelievers are raised following the Millennium only to be deceived again by the devil, to resume again the rebellion that led to their first death (cf. 20:5-6), to be killed and raised again (20:5, 13), then face "the second [?] death" (20:14)? Or, are these nations actually demonic powers? Or, does this vision simply repeat in new imagery the message related in earlier visions in the book? John does not say. This much is certain: John affirms that evil is tenacious despite the repeated warnings of judgment throughout history, and yet he insists that Satan's rebellion against God will ultimately fail. John pictures Satan's final war against God as a military maneuver against the camp of God's people. This Old Testament imagery refers to the Church as a pilgrim people. But then the imagery changes: Satan's forces march across the breadth of the earth and surround the city he loves. This reference to Jerusalem refers symbolically to the Church. John presumes the presence on earth of the holy city New Jerusalem, that he does not describe in detail until chapters 21 and 22. As in the battle in chapter 19, God single-handedly defeats his foes. With the defeat of his army of nations, the devil, who deceived them, is thrown into the lake of burning sulfur. He is consigned to Hell, where he joins his cohorts, the beast and the false prophet (see the notes on 19:20). There, the evil trinity will be tormented day and night for ever and ever. Each of the verses of Revelation 20:4-6 mentions the Millennium — the thousand years. The context of these verses between Rev. 20:2-3 and 7 leads to the conclusion that the period of Satan's confinement and the reign of Christ coincide. Little of what is popularly assumed about the so-called "Millennial Reign of Christ" is found in Revelation 20. And yet this is the only biblical passage that explicitly mentions it. John's obvious motive in presenting this vision is not information but inspiration — to encourage the Christians of Asia to remain faithful until death. We certainly misinterpret the book if we fail to accept the same encouragement. John sees thrones as he had in his earlier visions (Rev. 4:4; 11:16). Although he says the raised saints reign with Christ, the authority with which God entrusts them is judgment (cf. Dan. 7:22; Rom. 5:17; 1 Cor. 6:2-3). If we are intended to read the book sequentially, and all of unbelieving humanity has been destroyed in the judgment of Revelation 19, who do these saints judge? In what does their judgment consist? And who precisely are these who reign? According to Revelation 1 (vv. 5-6) and 5 (v. 10), Christians already in this present age serve as "a kingdom and priests . . . on the earth." In chapter 3, the risen Christ promises those who overcome "the right to sit with [him] on his throne" (3:21). But according to Revelation 20, the "people sitting" on the judgment thrones are resurrected Christian martyrs — literally, those who have been beheaded. Some translations paraphrase this freely by referring to those "executed" (Today's English Version) or "killed" (New Century Version) for their faith. Revelation 6 has already described the beheaded saints coming to life to receive (Rev. 6:9) the "white robe" of immortality (3:5; 6:11; 7:15). Does Revelation 20 describe the same event from another perspective, or is this a new event? John does not say. Nor does he explain where they came to life — in heaven or on earth — despite the assumptions of Dispensational interpreters. What John explains is why they were beheaded — because of their testimony for Jesus and because of the word of God (see the notes on 1:2, 9; 12:11; 19:10). Their witness involved a refusal to worship "the Beast" or his image or to receive his mark on their foreheads or their hands (see 11:7; 13:8, 12, 15; 14:9, 11; 16:2). They refused to compromise with the anti-God world system and its consumer economy. John distinguishes beheaded believers who are already raised and the rest of the dead who do not come to life until the Millennium is ended. This distinction might be between ordinary believers and beheaded martyrs. Other apocalyptic literature encourages steadfastness in the face of mortal threats by assuring potential martyrs of a resurrection in advance of the eschaton. But more likely, "the rest of the dead" refers to the rebellious masses slain in the judgment described in Revelation 19. In this case the distinction is between a resurrection of the just for reward and a later resurrection of the wicked for judgment. Whatever John's intent, he identifies the return to life that precedes the end of the 1,000-years as the first resurrection. According to Rev. 14:13, all "the dead who die in the Lord from now on" are "blessed . . . , for their deeds will follow them." This might imply that "for a faithful Christian death is resurrection" (Harrington, p. 200). That is, deceased Christians are raised immediately to share in the heavenly reign of Christ. Unbelievers, however, are not raised until the Last Judgment. Thus, "the first resurrection" refers not to a single moment, but to repeated "resurrections" throughout the present age. John nowhere refers explicitly to "the second resurrection" (but see 20:13). Nor does he make any reference to the status of living Christians at the time of the Second Coming. Those who may expect to participate in the first resurrection are not only happy, they are also holy. Personal holiness is a necessary requisite for all who would share in the resurrection to eternal life. The basis for the blessing is stated negatively and positively. First, the second death has no power over them (see the notes on 2:11). Although they may die physically, they will never experience the death of eternal damnation (cf. John 11:25-26). Second, the risen dead will be priests of God and of Christ and will reign with him throughout the Millennium (see the notes on 1:5 and 20:4) as they await the final resurrection. Revelation 20's description of the Millennium is John's picture of the situation of the present age — between the first and second coming of Christ — tribulation on earth, but triumph in heaven. Satan's power has been curbed by the paradoxical victory of the slain Lamb, who is nonetheless the strong Lion. God overcomes the power of evil by self-sacrificing love. Death continues in this age, but those who remain faithful until death will share in Christ's heavenly reign. Eschatology is important, not primarily for the answers it provides for our curiosity about the future. Our vision of the future shapes our sense of mission in the present. And so we turn in conclusion to Revelation 21. Revelation 21 (v. 16) describes the heavenly city that will descend to earth to become the dwelling place of the redeemed of all ages as a perfect cube that is 1,500 miles on each side. For the time being, let’s ignore the engineering problem related to the height of this gigantic cube. This nearly 800,000 story apartment building will present a serious challenge for those residents who live above the 800th floor. Forget the elevator for now. Above 8,000 feet residents are going to need oxygen and pressurization. Let’s ignore what such a massive structure might do to the earth’s rotation on its axis, etc. Keep in mind that this city is called New Jerusalem. But the entire nation of Israel is only 150 miles long and 70 miles wide. This city has a surface area more than 200 times that. In fact, this city would cover the entire Mediterranean world from Palestine to Rome. And perhaps that’s precisely the point of this enormous structure. The new order God has in mind will one day unite people of all nations and cover the entire known world. Does that give you any clues as to what we ought to be doing in the meantime?